Individualized, one on one training with real-time feedback corrects issues while preventing bad habits from forming. Winter sport enthusiasts, skiers and boarders have different mountain goals. Whether you are looking to conquer moguls, or just make it down the terrain park safely, the Snow Biste deck and the Snow Biste method will train you to meet those goals quickly. For those looking to compete in Alpine Ski Racing, the owner Kris is an active USSA Masters racer that understands the changing technology and techniques such as the Stivot or the Ligety line. If you need to get up to speed fast for a big mountain vacation private training is ideal to get you ready. Whether you’re looking for downhill racing lessons or want to expand your skills by taking mogul lessons, Snow Biste gets you on the mountain faster with better results than traditional skiing lessons alone. Snow Biste is a new form of Slope Ski Technology. It’s not covered in snow, isn’t windy and cold and doesn’t have the exact feel of snow, but all of the skills and muscles developed on it directly transfer to the slopes. Its unique properties create more friction and therefore create more muscle. Repetitive actions and ongoing practice develop muscle memory much faster due to the pure focus on a particular skill. Ultimately, off season ski training on the Snow Biste results in more skill and endurance in a shorter amount of time. We offer a full learning process that starts with and builds upon the initial one hour fast start foundational session. During that lesson we discuss the client’s mountain goals and time frames. We teach terminology and how to be happy and successful on the mountain the first day out. 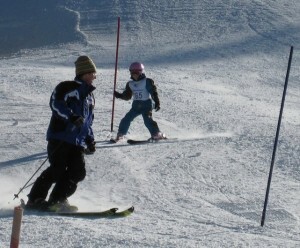 The on deck portion of the lesson familiarizes you with the unique properties of the track while teaching you the most important skill in mountain sport – stopping. We do it in a way that is very unique – We Don’t Teach Pizza Here! We teach the fundamentals of shape ski technology and modern boarding techniques. Indoor training on the Snow Biste, physical fitness routines, a mountain transition lesson and ultimately guided mountain skills development are all a part of this fun and rewarding journey. 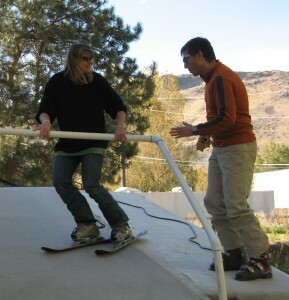 If you are a beginner, Kris has every confidence that you will be skiing on the deck by the end of your first training lesson. By the end of your fourth lesson you will be able to stop, turn, pivot, and safely get down the mountain.